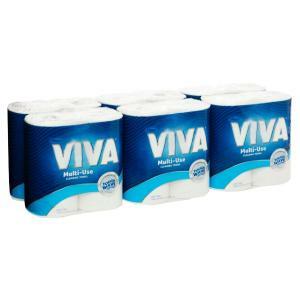 Keep stainless steel looking like new with VIVA stainless steel wipes. Ideal for use on stainless steel refrigerators, rangehoods, BBQs, dishwashers and more. The unique MarkGuard technology will remove stains and grease without harsh scrubbing, leaving a thin invisible layer to repel fingerprints, smears and dust. Quick and easy to use - simply wipe over stainless steel surface, following the grain, until clean. Roll towels are sourced from FSC® certified pulp.